Cubby House Crafts: Some new fabric!! I was unable to collect a parcel from the post office on Thursday, so I had to wait until today. A fabric parcel of yumminess all the way from the US that only took one week to arrive to here in Tassie! 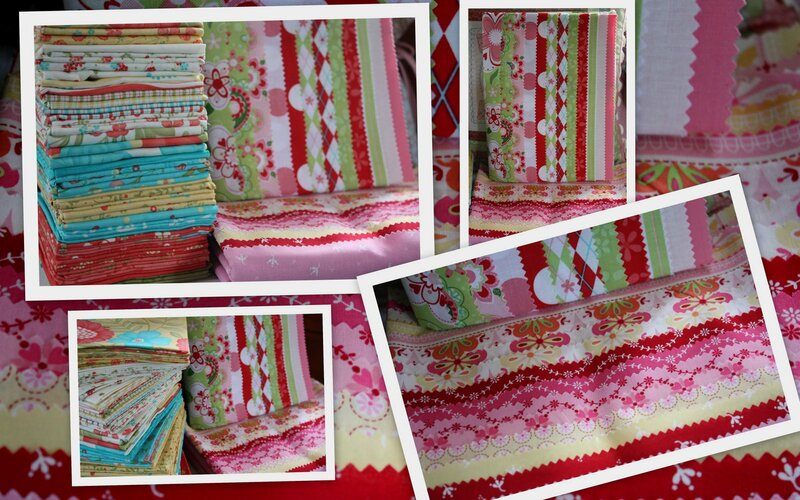 Lovely by Sandy Gervais, Rosalie Quinlans Cherry Sweet Broderie and Kiwi Sugar and Spice...all so gorgeous! How am I going to be able to make that first cut? Time to have another sewing session with miss 9, she is making a little doll and has hinted about using some of my new fabrics for the dress!!!! I hope you are all finding some sewing time over the Easter break! Lots of Pretty Hexie's Too.. Your fabrics are delicious, I just bought Sugar and Spice fabric but it hasn't arrived yet. I can't wait, its so nice. Where did you buy yours from? I hope you don't mind me asking you. I love your hexagons, they are very pretty. I swear my heart missed a beat when I saw your new fabrics! So much gorgeousness in one photo... it's too much! Love your hexies too. They're so pretty with different fabrics for each petal. Think I should have tried a bit harder to get some of that fabric in my bag....LOL! Great idea with the hexies....will give what your working on a real scrappy effect. I too am drooling at the sight of such gorgeous hexies. Lovely fabrics. Those fabrics look good enough to eat! I'm not surprised they have inspired the "ooo pretty!" in a 9 year old. 8) I keep drooling over those hexies too, but I already have SO much to do! Gorgeous fabrics and I love those hexies!